Salvador de Bahia is the 4th largest city in Brazil, and is situated in the Northeast of the country. As across the rest of the country, urban areas such as Salvador have high levels of inequality. Often rich people in luxury condos live very visibly beside poor communities and informal settlements. The Saramandaia neighbourhood was founded in the 1970s, and is located in a central area of the city. Currently there are 40,000 residents inhabiting 8,000 households. In order to combat the city’s traffic congestion, a series of expressways are planned. One of these is the Linha Viva which is planned to pass through Saramandaia. The Linha Viva project would require around 3,000 residents to be evicted, and yet, residents have not been involved in the planning process. Alex, aka ‘Leco’, is a resident of Saramandaia and founder of Arte Consiente, an initiative aimed at providing cultural activities to children and youth in the community. The Arte Consciente initiative complements the education of youth, providing information about Salvador’s Afro-Brazilian cullture and identity. Leco cites himself as an example of the transformative power of music. Entering a social programme kept him off the street and showed him another side of life, something to aspire to. Arte Consciente provides an alternative to public policy which has often been insufiecient in ensuring the right to the city for marginalised citizens. 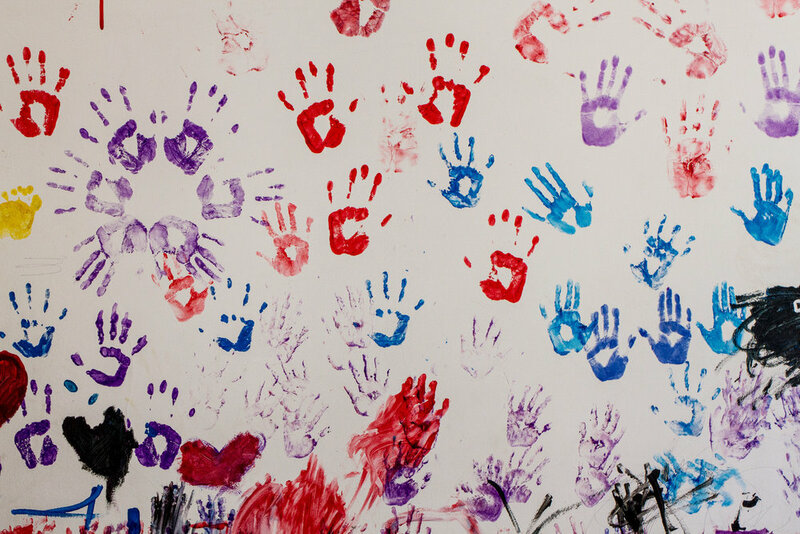 The centre teaches children and youth activities such as music, art, boxing, capoeira, juggling and dance as a way to encourage school attendance and keep young people away from engaging in street crime. The Linha Viva project would cut right through the large neighbourhood, uprooting many and dividing the community, a threat that hampers not only the right to the city of vulnerable populations, but also their dignity. The neighbourhood is classified as a Special Zone of Social Interest (ZEIS), which recognises its vulnerability as well as the need for the provision of social housing and social infrastructure. Despite its strategic location and being categorised as ZEIS, Saramandaia lacks social infrastructures such as secure housing and spaces for leisure. Saramandaia is located beside an upmarket shopping centre. This girl said that her and friends enjoy looking at it but can’t enter as it is “only for chic people”, an internalisation of the stigmatisation of the community. Cultural and artistic activities can be a way of generating a collective identity and fostering a pride in the community and Afro-Brazilian culture as a means to counter negative representations. Arte Consiente therefore provides not only an important social infrustructure by encouraging youth to engage in cultural activities, but helps create visibility and voice. Gamboa de Baixo is a neighbourhood located near the coastline and close to Pelourinho, the historic city centre. It is a traditional fishing community of about 350 predominantly black families. Luxury high-rise blocks overlook Gamboa de Baixo. This community has been segregated partly because of the construction of the Avenue Contorno, a large motorway that seperates the community from the city. A fisherman from Gamboa de Baixo. The livelihood of Gamboa de Baixo’s fishermen is dependent on access to the sea. Given the prime location of the community, the threat of displacement is high. The community centre in Gamboa de Baixo looks out to the ocean. The community has been misrecognised and portrayed as a place of drugs, criminality and dirt. These representations are perpetuated in the media. The Salvador coastline has undergone a series of urban development projects over the years. Urbanisation has been envisioned through ‘modernisation’ projects. Gamboa de Baixo is one of a number of vulnerable coastal communities facing challenges as a consequence of urban development. Residents have used identity and culture to combat misrecognition. Fishing is an inherent aspect of the community and their relation to the sea is one of the reasons for their right to stay in the Bay of All Saints. The Lower Town of the historic centre is divided from the Upper Town by a sharp enscarpment, and is connected by the Elevador Lacerda visible in the distance here. The Lower City has recently been subject to state facilitated real estate speculation, though the buildings are protected by law and cannot be demolished. The government and property owners have often left historic buildings to ruin as a strategy to sell to developers. Some vacant buildings have been occupied by social movements such as MLB in Ocupação Luísa Mahin. Occupation of historic buildings by social movements serves as a strategic and political claim for the right to live in the historic centre. Ocupação Luísa Mahin is an occupation of a public building that had previously been used by the government of the state of Bahia as the Public Centre for Solidarity Economy and had been left abandoned since 2014. The occupation sits within the commercial centre, and is surrounded by office blocks, as well as other abandoned and occupied buildings. Marcos Antônio is a leader of the MLB socialist movement and a resident of the occupation. For MLB, the occupation serves primarily as a way of increasing the use value of the building. “For the right to memory and the truth”. Posters in the occupation demand justice for the “torturers and of the brutal military dictatorship that ruled Brazil from 1964-85. The occupation is an act of resistance which aims to fight for dignified housing, converting the building into a place for family living and, in the wider context, to explore the space for occupation movements in Salvador. The occupation is not only a political instrument of MLB but also a tool for the residents to further their common claims for advancing their right to the city. For residents like Teresa (seated), the occupation is a way of being able to live a life with dignity as a social right. Stickers of Brazilian football clubs line the fridge in Teresa’s apartment. Alongside a poster of Lenin an MLB sticker proclaims public creches and education to be a right. They favour the provision of places for mothers to leave their children as it is also the right of women to be able to work. Ocupação Luísa Mahin has its own creche. Two children from Ocupação Luísa Mahin. “We are fighting daily to lead us to a new society”. Residents of Luísa Mahin have dedicated the second floor of the building to an educational space designated to provide free education. A resident of Ocupação Luísa Mahin looks out onto the streets below. A young resident of Ocupação Luísa Mahin. 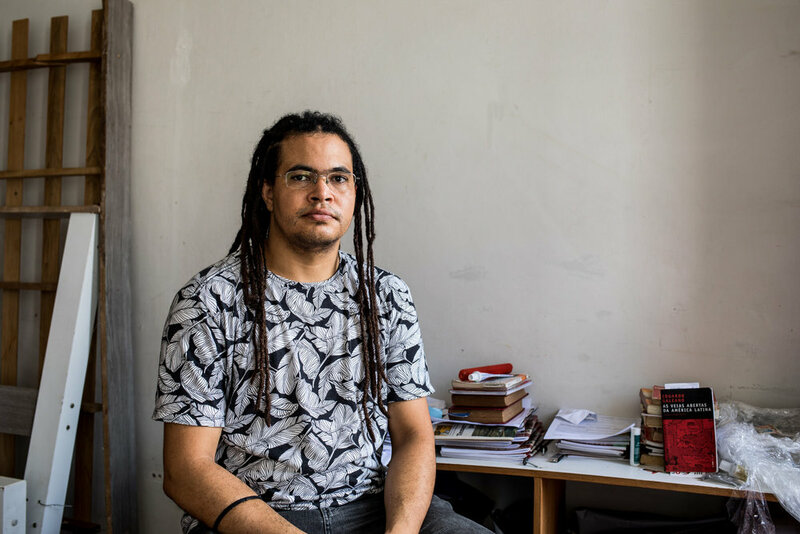 Wagner Moreira a leader from the MSTB social movement (Movimento Sem Teto da Bahia - Homeless Movement of Bahia) in his room in the occupation. “The only fight that is lost is the one that is abandoned”. A quote from Marxist Brazilian writer Carlos Marighella is scrawled on the wall. Marighella was born in Salvador. Looking down from the rooftop of Ocupação Luísa Mahin. Jean, a resident of Ocupação Luísa Mahin. Close to the cidade baixa is the commmunity of Ladeira da Preguiça which is made up of narrow streets and vacant warehouses, and has over time lent itself to organised crime and, most recently, to drug-trafficking. In recent years, the stigma of violence and insecurity has been used by the municipality to justify a privatisation project that was meant to regenerate –and gentrify– the area. Residents of the community have collectively mobilised to rehabilitate the Ladeira, reconstructing collapsed mansions and painting decaying façades with colourful graffiti referencing the African Diaspora. Slave carrying shipments from the lower to the upper city. Grafitti such as this exposes Brazil’s institutionalised culture of exclusion as a means to call for the city to remember and to claim their housing rights. Nordeste de Amaralina is a large and well-located neighbourhood and one of the oldest in Salvador. It is located in the south of the city, wedged between the beach and the City Park. For a long time, the four communities that together comprise Nordeste de Amaralina have been facing social issues such as unemployment, low income and social unrest, in part due to police violence and drug trafficking. Mr Armeng is a local rapper who teaches art, dance and culture to children as a weapon to resist the lure to join the drug traffic. Culture can be used to produce pride in identity and in the community of Nordeste de Amaralina. Nordeste de Amarelina is surrounded by high-income districts. Many luxury apartment blocks line the ocean front, and are separated from Nordeste de Amarelina by a wall and protected by razor wire. The word ‘Faith’ is written on a wall on the Nordeste de Amarelina side of a wall that divides two communities of Salvador residents, the rich and the poor. The wall is a product of fear. Mr. Armeng poses by a mural depicting four members of the Revolt of Buzios, a late eighteenth century slave rebellion in the then captaincy of Bahia. ‘Minha Casa, Minha Vida’ is the largest social housing programme in Latin America, though locations of projects often have poor accesses to services in the city. Bosque das Bromélias in the outskirts of Salvador is an example. Many occupants that were squatting at the Bosque das Bromélias project occupied neighbouring land, known as Ocupação Guerreira Maria. The occupation was organised by the largest social movement for housing in the city, MSTB. The occupants of the land are building their own homes on the land, the early stages of a new favela. Children watching music videos projected on the walls of the community centre in Ocupação Guerreira Maria. Maria Lucianne Lobato Ferreira (Lôra), a leader from Guerreira Maria and state coordinator for MSTB. Lôra says she doesn’t feel that she has the right to the city. Children from Ocupação Guerreira Maria. 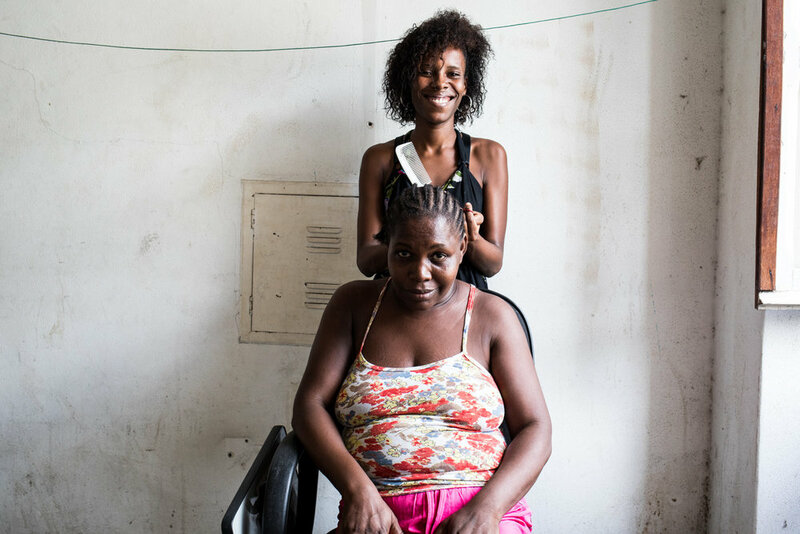 For many, the Minha Casa Minha Vida social housing programme has failed to recognise the beneficiaries’ values and aspirations. Across the city there are multiple narratives and claims for the right to the city. However, the numerous social movements and communities continue to fight for a more socially just and equitable Salvador. Salvador is Brazil’s fourth largest city and former capital, situated in the state of Bahia in the Northeast of the country, and is the centre of Afro-Brazilian culture. Similar to cities across the rest of Brazil, Salvador has urbanised in an unequal and exclusionary way. Poverty and exclusion are closely linked, with social differentiation marked clearly in space. The unequal distribution of land and property in Salvador has led to the segregation of the poor from the wealthy, a division which also has strong racial and cultural dimensions. Many of the urban poor inhabit substandard conditions, with options of better accommodation in the city limited. In addition, many of the communities are stigmatised and criminalised, further limiting their potential to engage as equal citizens and access the same rights as the rest of the inhabitants of Salvador. The right to the city – a concept developed by French philosopher and sociologist Henri Lefebvre – deals with the struggles of social movements for a radical change in gaining better access to the city, to reinvent and to transform it. In Salvador contestations have emerged in which residents use space to challenge exclusion, with occupations of land and buildings just one way that poor residents of Salvador have attempted to access the right to housing and urban life in a divided city. Social movements have also been using culture and identity as a way of challenging misrecognition and misrepresentation. As with other cities in Brazil, such collective practices are a way to try to achieve a recognition of their rights as citizens to engage equally in urban life. These photographs document some of these struggles faced in communities across Salvador, including Gamboa de Baixo, Nordeste de Amaralina, the Historic Centre, Saramandaia and Ocupação Guerreira Maria.